This one might be the creepiest one yet…totally perfect for this great picture. However, let us know below if you think this is truly appropriate or inappropriate for a teacher to say to anyone in a lesson?! Enjoy how awkward this one is! 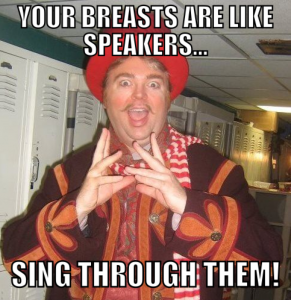 Again, please remember that we are always open to receiving quotes you may have from your “Vocal Journey” as well, so please share them with us by sending them to us at: info@m-ostudio.com and we would be glad to feature them in this wonderfully creepy MEME of me when I was Parpignol in La Bohème at Des Moines Metro Opera. It’s the perfect photo for all your creepy teacher quotes. Posted in Funny Singing-Related Stuff and tagged acting, Concert, Funny, lessons, M-OStudio, Master Class, motivation, Music, Performing, quote, sing, singer, Singing, Students, Teacher, Teaching, voice, Voice Lessons, YouTube.